This document details the history and functions of the Internal Improvement Fund. This fund was created in 1851 to handle the sale, maintenance, and leasing of public lands. These public lands came from an initial grant of 500,000 acres from the federal government at the admission of Florida as a state. More land was available as well for use of public education. The fund's earliest tasks were the construction of railroads and improvement of waterways. The fund's focus shifted to land reclamation and drainage during the 1880s, continuing into the 1920s. 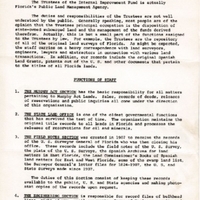 The fund also played an active role in the drainage of the Everglades during this period. This document further details the bureaucratic structure of the fund, as well as data on the amount of land still controlled by it. Original 6-page typewritten report: binder 1968, Friends of Lake Apopka Archives, Ginn Museum, Oakland Nature Preserve, Oakland, Florida. Digital reproduction of original 6-page typewritten report. Binder 1968, Friends of Lake Apopka Archives, Ginn Museum, Oakland Nature Preserve, Oakland, Florida. “Functions of the Trustees II Fund.” RICHES of Central Florida accessed April 22, 2019, https://richesmi.cah.ucf.edu/omeka/items/show/6582.